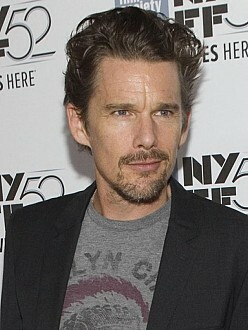 Ethan Hawke was ”staggered” by how much his life changed when he had children. The 44-year-old actor has a total of four children, Maya, 15, and Levon, 12, with ex-wife Uma Thurman, and Clementine, six, and Indiana, three, with his current spouse Ryan and admits he found it ”fascinating” to realize how differently he needed to ”structure” things once he had kids and thinks parenthood has made him more reflective. Even as his kids get older, the Boyhood star still finds parenting an ”adventure” but he hopes he is a better dad now. The Newfoundland-filmed Maudie starring Sally Hawkins and Ethan Hawke took home seven Canadian Screen Awards last night during the ceremony, broadcast on CBC. The coming-of-age drama Moonlight was the star of the show at last night’s Gotham Awards, winning Best Feature, Best Screenplay, and Best Ensemble Cast.